In case you haven’t already figured out from my previous posts on sunflower shoots, pea shoots, and frisée, I really love a good salad. When you’re working with greens from your farmers market, CSA, or backyard garden, it’s especially important to take the time to whip together a good dressing to showcase the quality of your salad. To make nutty vinaigrette, pick an oil, vinegar, nut, and seasoning (or two) from the following list. Once you’ve chosen your ingredients, place them in a blender or food processor (I have a 4-cup food processor that is just perfect for whipping up salad dressings). Sprinkle the ingredients with salt and freshly ground black pepper and turn the machine on. Taste and adjust the seasoning if necessary. 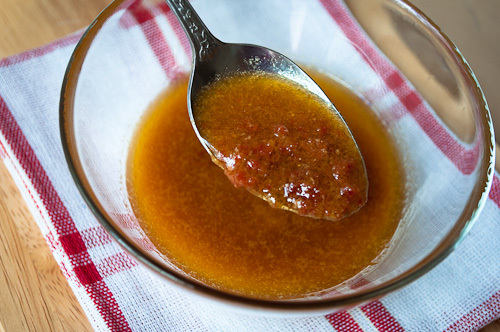 Drizzle the vinaigrette over your salad, toss, and serve. This vinaigrette will keep in the refrigerator for 4 or 5 days. I like to store my vinaigrette in Mason jars so I can just bring them back up to room temperature and give them a good shake before using. Last night I made a nutty vinaigrette with olive oil, rice wine vinegar, sunflower seeds, honey, and Penzeys Spices’ Sweet Curry Powder. It was delicious on a salad of pea shoots. Image courtesy of joana hard via a Creative Commons license.